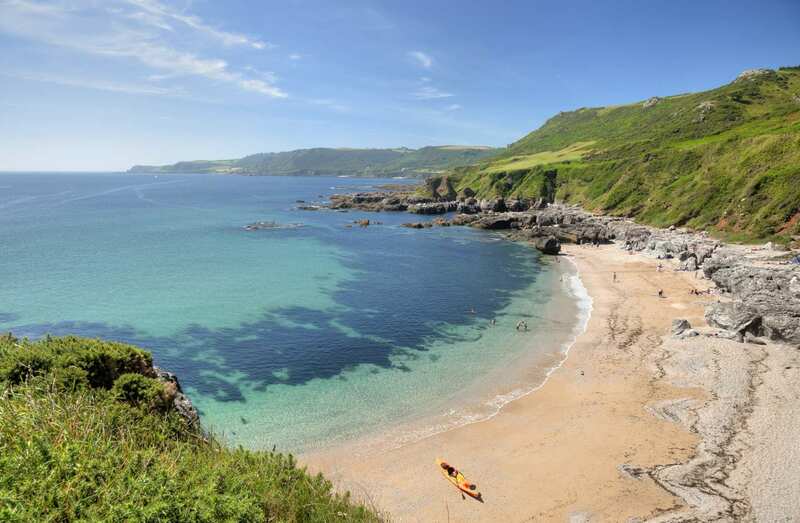 Walk the South West Coast Path through North Devon on a self-guided walking holiday. Accommodation, luggage transfer and custom holiday pack included. Minehead to Westward Ho! along the North Devon section of the South West Coast Path. Here in North Devon, the South West Coast Path tackles the demanding climbs and descents of the highest coastline in England. Dramatic landscapes abound, from the jagged sandstone pinnacles at the Valley of Rocks to the gorge at Heddon Mouth. It’s not all hilly terrain: the coast softens as the walk progresses, taking in coastal oak woodlands and sweeping sandy beaches. It dips into seaside villages on its way, and even visits the smallest complete parish church in England: Culbone. Scaling the highest point on the South West Coast Path: ‘Great Hangman’. Visiting North Devon’s Biosphere Reserve. Spotting cheeky Exmoor ponies out across the purple-tinted moors. An extra night gives you the chance to explore some of the towns and villages along the trail or to relax and give those weary legs a rest. Porlock Weir is an excellent place to linger and relax while Lynmouth is another place to consider. The walk to Watersmeet, where the East and West Lyn Rivers meet, is delightful. End of holiday: Westward Ho! By Air - The most convenient major city and international airports are Exeter, Bristol and Newquay. By Rail - The nearest rail station to the start of the trail (Minehead) is at Taunton (about 24.5 miles away). The nearest rail station to the end of the trail (Westward Ho!) is at Barnstaple (about 10 miles away). By Bus - Various bus services run to Minehead and from Westward Ho!. From London - Trains run from London Paddington station to Taunton. From there a bus/taxi will be required to Minehead. Return To The Start - The easiest way to return to the start of the trail is to take a bus/taxi to Barnstaple rail station. From there trains run to Taunton, where a bus/taxi will be required to Minehead.